Appeal to readers and their individual interests. Deliver the right content at the right time through smart targeting, content recommendations, and messaging. Unify reader engagement history across different channels, then use it to build deep audiences for real-time personalization. Replace multiple despaired point solutions with one unified platform for recommendations, targeting, messaging, and experimentation. Move your campaigns through the queue and set them live in a matter of days. Centralize your audience data and use advanced segmentation to uncover real-time insights and trends in your data based on content consumption, profiles, behavioral patterns, and more. Maximize each story’s readership and keep users coming back by adapting the user experience to each reader. Improve engagement, conversion rates, pages per session, and overall user satisfaction. Always recommend content that is relevant and meaningful to each reader based on both automated algorithms or rule-based approaches, saving valuable time in the selection process. Inform your editorial strategy with scientific experimentation methods. 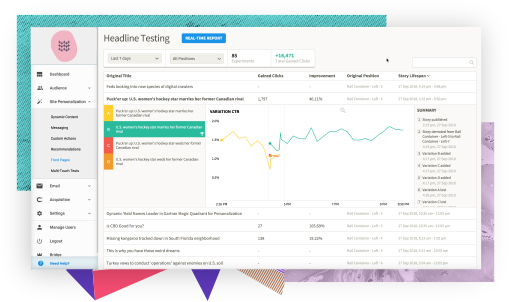 Adapt the user experience and test page elements like headlines, page layouts, recommendation strategies, and more - all within your normal workflow. Convert more one-time visitors into known readers with email capture notifications, subscription overlays, exit-intent popups, content suggestion widgets, and more. Extend personalization beyond the web. Program triggered emails and push notifications to showcase content recommendations based on past consumption or affinity to topics readers have previously browsed. Assess your ability to deliver superior customer experiences and benchmark your results with others in the media industry. Here are 5 challenges publishers face when implementing out-of-the-box A/B testing solutions - and how to overcome them.